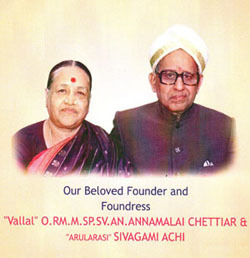 Our Founder Lion Thiru.O.RM.M.SP.SV.AN.Annamalai Chettiar, B.Com.,Dip. in Journ., was born on 27.12.1923 in Devakottai, a socially and educationally backward area.Â He had his graduation from Loyola College, Chennai.Â He widely travelled abroad and was a great reader of books.Â He considered that education and health are quite essential for a good life. 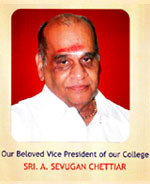 Holding the conviction that education is the key to open the doors of upliftment, he institutedÂ Sree Sevugan Annamalai Collge in 1970Â and thereby brought the unknown Devakottai in the educational Map of Tamilnadu.Â Born out of his benevolence, our College has made it possible for the poor people in and around Devakottai to gain access to the portals of higher education. He also institutedÂ Sree Sevugan Annamalai Matriculation SchoolÂ and amini health centreÂ at Ezhuvankottai, a remote village from Devakottai.Â He generously donatedÂ Rs.15 lakhsÂ to Sri Vishveswaraya Medical College Hospital, Kottaiyur. With his guiding spirit he contributed his services asÂ Director in the Madras Cements Ltd., Thiagarajar Mills Ltd., and Bank of Madurai Ltd.Â He also served as theÂ Syndicate Member of Alagappa University, Karaikudi.Â He was also theChairman of Indian Finances and Factors Ltd., Chennai.Â His sympathy with the socially down trodden raised him to be the Deputy Governor in the Lions International. He has been well recognized as a great Philanthropist and a man of great values. Under the able stewardship of our beloved founder and his family members, our College has been making big strides for the past 42 years in all spheres of its activities, especially in academic programmes, enrolment of students and number of Degree holders.Â The quality of higher education in a disciplined academic ambience is no wonder the attraction of students and research scholars to our College.Â Thus our College has earned the recognition as one of the best colleges in Sivagangai District and one among the reputed Colleges in Tamilnadu. Naturally he had won the hearts of the people and they affectionately called him â€œVallalâ€� which means donating everything to the poor. 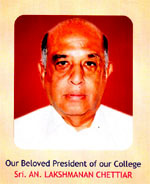 The greatest tribute that we can pay to him is that we reaffirm our faith in his great ideals and dedicate ourselves toÂ work strenuously to achieve his noble goals and make his dreams come true and take the College to glorious heights under the active and dynamic leadership of his sons Sri.AN.Lakshmanan Chettiar, President of the Managing Committee and Sri.A.S.Sevugan, Vice President of the Managing Committee, Smt.L.Lakshmi Achi, Secretary of our College who follow the foot prints and the rich tradition built by our founder, the peerless philanthropist. Of all charitable deeds, establishing educational institutions to cater to the educational needs of the people irrespective of their caste, creed and status is the best deed.